A large number of Chinese security forces have been deployed in Tibetan Gansu and Qinghai provinces, where the police aims to monitor the crowds gathering for religious festivals and, possibly, to protest. Many armed police vehicles arrived to the Labrang Tashikyil monastery in Gansu where at least 12,000 Tibetans had assembled to participate in the unveiling of a religious painting. Chinese forces have set up checkpoints and barracks to inspect the Tibetans in three counties within the Tibetan Autonomous Prefecture. Chinese security forces have been deployed in large numbers in Tibetan-populated counties in Gansu and Qinghai provinces, with police closely monitoring crowds gathered for religious festivals and bracing for possible protests as a politically sensitive anniversary approaches, sources said. 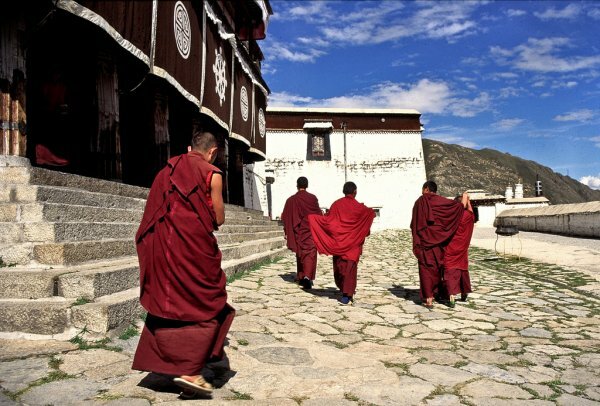 At Labrang Tashikyil monastery in Gansu’s Sangchu (in Chinese, Xiahe) county in the Kanlho (Gannan) Tibetan Autonomous Prefecture, several hundred paramilitary police arrived this week in advance of the March 3 unveiling of a large religious painting, a local source told RFA’s Tibetan Service. “The display is an annual event and attracts many Tibetans,” RFA’s source said, speaking on condition of anonymity. “Many armored police vehicles have now moved into the area bringing several hundred police armed with rifles” to monitor the crowd, the source said, adding that at least 12,000 Tibetans had gathered to participate in the event. Other official vehicles deployed to the scene included “two vehicles equipped to spray tear gas and a fire truck,” the source said. Drones sent to take photographs of the crowd were also spotted flying overhead, the source added. Meanwhile, Chinese forces "are on high alert" in three counties of Qinghai’s Golog (Guoluo) Tibetan Autonomous Prefecture, a Tibetan source in Switzerland said, citing contacts in Golog. “In Machen [Maqin], Gade [Gande], and Pema [Banma] counties, the authorities have deployed a large number of police,” the source, named Sonam, said. “They have set up checkpoints at major crossroads and bridges, and have even established barracks in areas straddling the three counties, to strictly inspect local Tibetans and passing vehicles,” Sonam said. The heightened security presence appears aimed both at intimidating Tibetans now celebrating religious observances during the Lunar New Year and at preventing protests on the coming March 10 anniversary of a failed 1959 Tibetan revolt against Chinese rule, Sonam said. Tibet’s spiritual leader the Dalai Lama fled Tibet into exile in India in the midst of the uprising, and Beijing has repeatedly accused exiled Tibetans, including the Dalai Lama, of stoking dissent against its rule ever since.